My regular readers will know how much I adore Indian cuisine, even though I am not of Indian descent myself. So for November, I invited readers to submit one of their favourite Indian recipes, with a randomly drawn winner from the entrants receiving a free copy of 660 Curries by Raghavan Iyer. This book is a treasury of wonderful Indian recipes from traditional to modern and fusion styles, suitable for beginners and experienced cooks alike, and is used constantly as a reference in my kitchen. Up first is Lisa of We Don't Eat Anything with a Face. 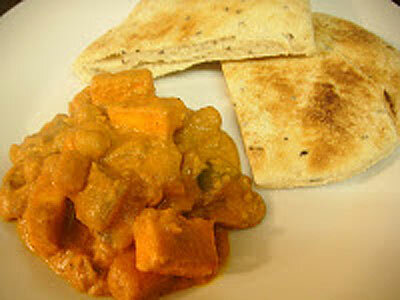 Paneer, mushrooms, spices, chickpeas, coconut and nuts and vegetables are all included in her dish. How could I resist this Paneer and Vegetable Tikka Masala? 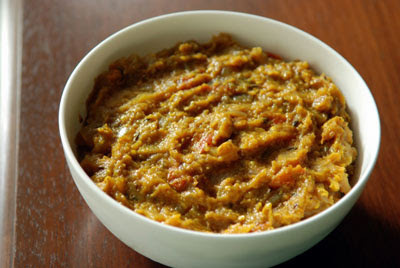 Janet of The Taste Space is up next this mouthwatering Indian Eggplant and Lentil Curry (Dal Bhat Meets Baingan Bharta). Though roasting the eggplants created a lot of smoke, this one-dish meal was certainly worth the trouble and effort. 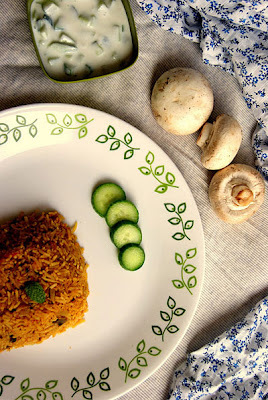 Divya of Dil Se has me craving dinner right now with a Mushroom Biryani. 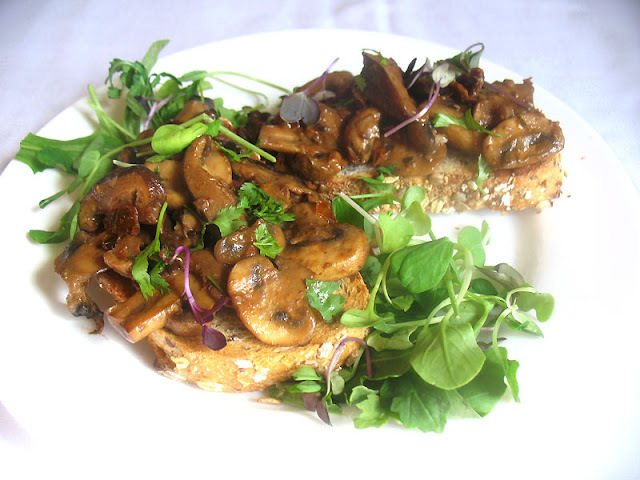 Spicy too, this will not fail to please mushroom lovers like myself. 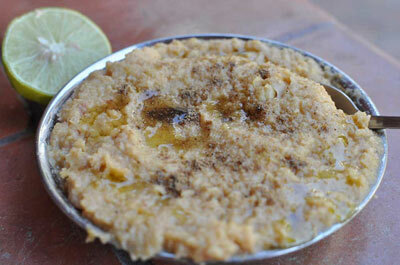 From Claudine of The Kathmanduo we have this delicious Channa Masala Hummus. I love hummus, and this inventive Indian-style take on it has my tummy rumbling. 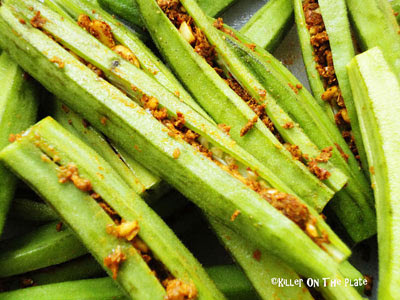 Privish of Killer on the Plate offers up this most tempting Spicy Stuffed Okra dish. This is a vegetable I need to make more often. Such a lovely presentation too. 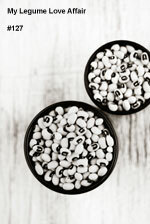 Nayna of Simply Food submits one of my all-time favorite Indian dishes, Dal Makhani. 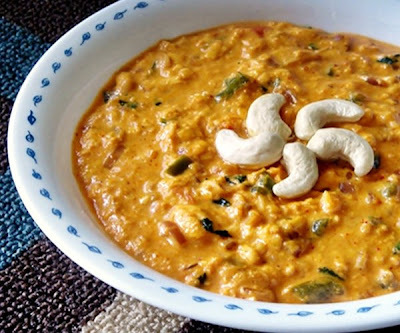 Creamy, healthy, rich in protein and packed full of flavour, everyone should try a dal makhani at some time. 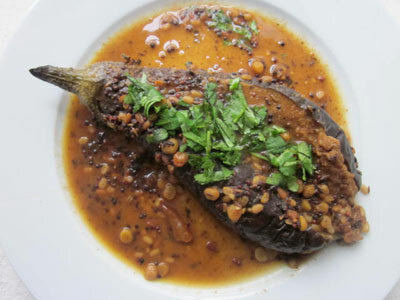 From Adam and Theresa of Keen on Food we have this gorgeous and very tempting Stuffed Eggplant Poriyal adapted, I was happy to hear, from one of my favourite cookbooks. I can never resist South Indian recipes, and this reminds me that I need to explore eggplant more often. Tangy and spicy, this beautiful Spicy Dahi Aloo, or potatoes cooked in yogurt, from Laavanya of Cookery Corner won't fail to please fans of Indian cuisine. And I don't know anyone who doesn't love potatoes. My contribution for this event is another one of my all-time favourites, and an Indian classic. 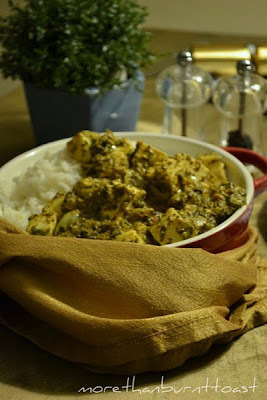 Mattar Paneer is a staple dish in any home that serves Indian food, and when I go out for dinner this is also one of my favourite menu choices. 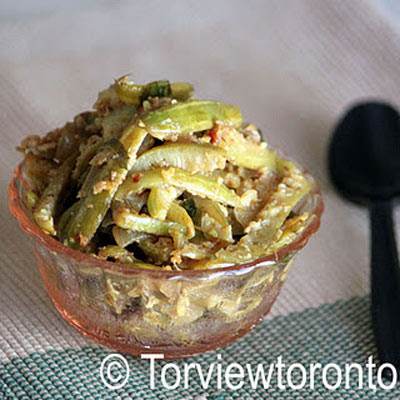 Akheela of Torviewtoronto treats us to this Ivy Gourd Stir Fry. I've yet to try ivy gourds — small Indian summer squashes — but this would be a great place to start. Now here is a Millet Bread from Vaishali of Ribbons to Pastas. 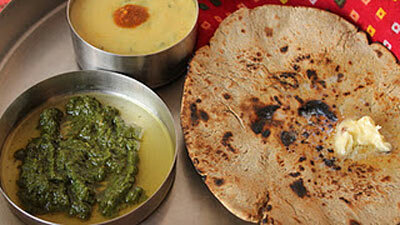 Green chutney is of course an essential condiment to go along with this Leele Doongri ne Kadhi ane Rotlo. This innovative creation surely tempts my palate. 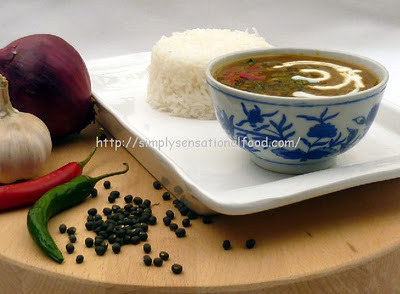 Geetha of Sun Moon and Tomatoes presents this lovely Kappa Curry (Tapioca in Roasted Coconut Sauce) inspired by her mom. 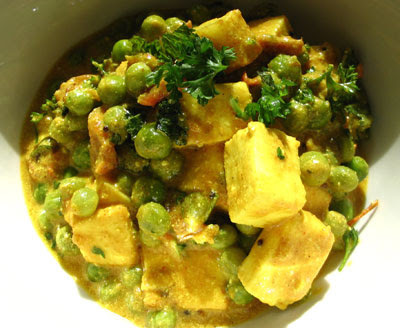 This South Indian dish is sure to please your palate. 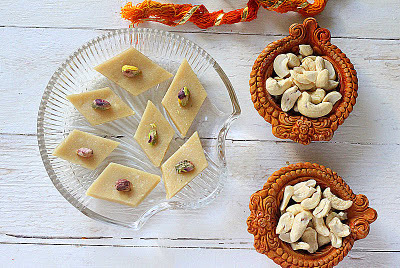 From Richa of Hobby and More, here is a delicious vegan and gluten-free Kaju Katli, or Indian Cashew Fudge. A perfect treat to share with friends and family to celebrate this month's Indian festivals. 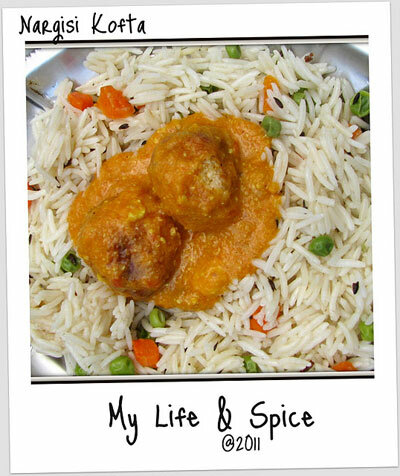 Deepika of My Life and Spice certainly has my mouth watering for this Nargisi Kofta. Another beautiful dish, Deepika certainly dresses this one up. The spice mixture sounds just divine. Stuffing a paneer or chenna cheese shell with raisins and apricots is a brilliant idea. Paneer cheese is one of my favourite foods, so how could I resist this Butter Paneer Masala from Reeta of mykaleidoscope. This is also one of my favourite restaurant dishes, but so much better when homemade in your own kitchen. Here we have another paneer dish from Val of More Than Burnt Toast. I made Saag Paneer myself recently, and it is always a favourite. I am so happy that I inspired this dear woman to learn more about Indian cooking. 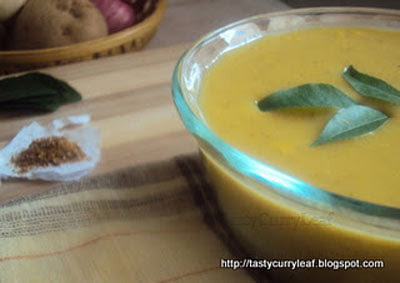 Another one of my favorites from Sweatha of Tasty Curry Leaf. A winter warmer indeed, you will have to try this Mulligatawny Soup. 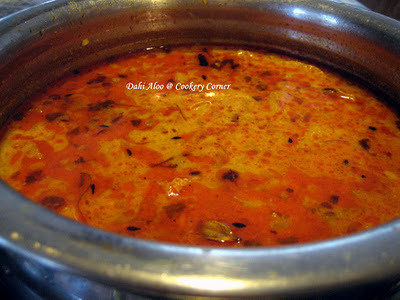 Adapted from another of my favourite cookbooks , this is a curry-flavoured soup from South India similar to South Indian rasams. Yum. 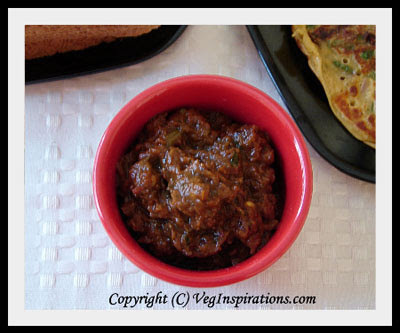 Sundried Tomato Chutney from Usha of Veg Inspirations. Wonderful flavours, and pictures of pretty flowers as well. I do so love sundried tomatoes and what a great creation. I am craving this just right now. 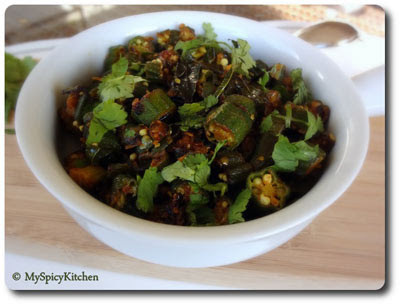 Usha of My Spicy Kitchen presents an Okra Stir Fry that will not fail to please us vegetarians. Simple and easy but surely not lacking in flavor, this is a dish I would enjoy anytime of year. 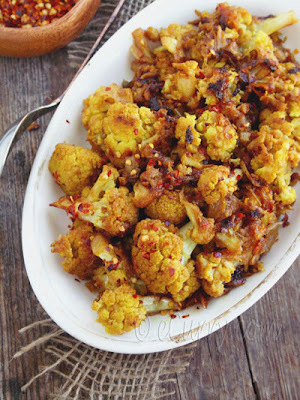 Sweet Soma of eCurry presents this tempting Pan-Fried Cauliflower with Yogurt and Soy Sauce. Inspired by her Grandmother, this Indian fusion Chinese dish is sure to please and it is easy to prepare. Wholesome and creative. Lynds of Vanilla Clouds and Lemon Drops offers up some gorgeous Spicy Chickpea Fritters. 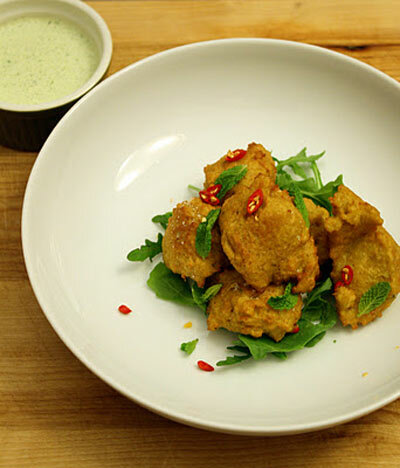 Certainly the best Indian food is made at home and I can't wait to try this dish. 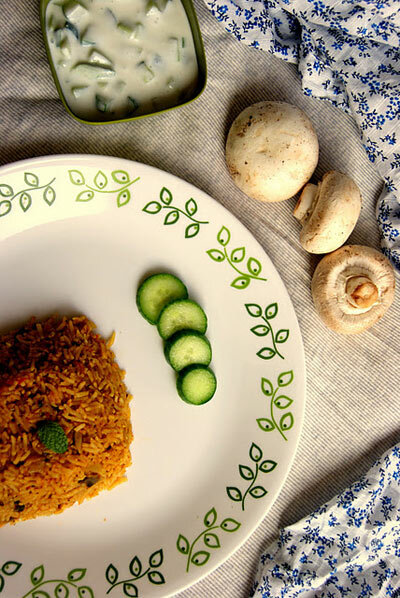 Priya of Easy N Tasty Recipes never fails to please. 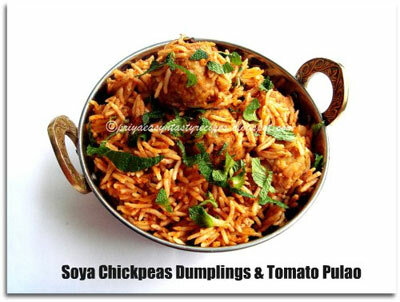 This one-pot meal of Soya Chickpeas Dumplings & Tomato Pulao will most certainly please and nourish hungry tummies. The possibilities are endless. Oh, more paneer! 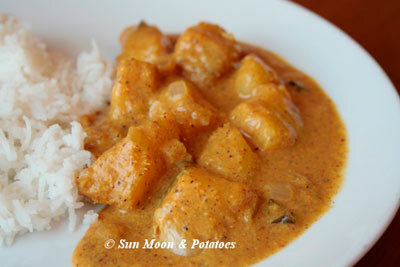 Mansi of Fun & Food Cafe has me craving this Kaju (Cashew) Paneer Masala. You can never go wrong with cooking with paneer, in my opinion, and your dinner guests will never be disappointed — that is for sure. Thank you again to all my readers who submitted these fantastic Indian recipes. I hope everyone finds something here to try. Excellent roundup Lisa,many delicious dishes to try and taste..
What an exciting selection of recipes. My mouth is watering and my tummy is rumbling. Great round up Lisa. An excellent selection of recipes. Plus I am so excited to have won!! Thank you. This is wonderful and tempting round up. Lovely round-up, Lisa. I agree that you can never have too many tasty recipes lurking around. Lovely round up Lisa and so many delicious entries. Can't wait to try several of these. 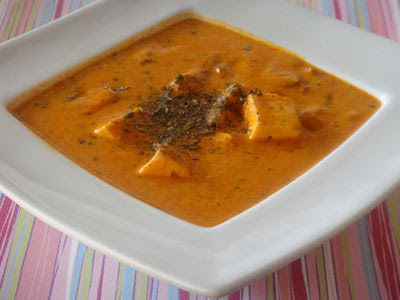 Wow, all these recipes are making me hungry for some homemade indian food, especially for dishes that involve paneer. Thanks for gathering them in one place! wow...so many great delicious recipes to try! Looks yummy! Great round up Lisa.. lots of delciousness to try! Everything looks amazing from start to finish Lisa. I am even more inspired to layer the spices! Thank you very much for posting so many interesting Indian recipes. I´m looking forward to try them. I love spicy food and I´m also vegetarian so these recipes seem like a right combination for me.